Eva Nine is at her bravest in the final book in the New York Times bestselling trilogy from the fantastical mind of Tony DiTerlizzi. All hope for a peaceful coexistence between humankind and aliens seems lost in the third installment of the WondLa trilogy. Eva Nine has gone into hiding for fear of luring the wicked Loroc to her companions. However, news of the city Solas being captured by the human leader, Cadmus Pryde, forces Eva into action once again. With help from an unlikely ally, Eva tries to thwart Loroc’s ultimate plan for both mankind and the alien life on Orbona. 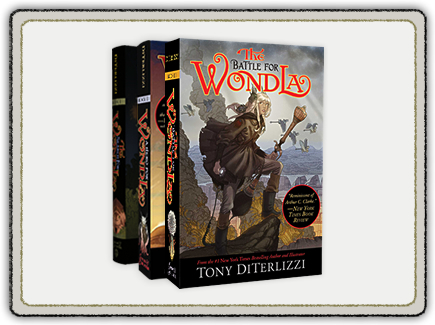 Complete with lavish two-color illustrations and spot art throughout, and starring a host of unforgettable characters that reinforce the importance of friendship, The Battle for WondLa has all the hallmarks of a classic book—of the future. TERI HATCHER has received Golden Globe and Screen Actors Guild awards for her role as Susan on Desperate Housewives, and also starred as Lois on the hit series Lois and Clark. She has appeared in the films The Big Picture, Spy Kids, Soapdish, and Tomorrow Never Dies, and gave voice to all three mothers in the Oscar-nominated, animated film Coraline. She voices a pirate on Disney’s Jake and the Neverland Pirates, and lent her voice to the film Planes. She is the author of the New York Times bestseller Burnt Toast and Other Philosophies of Life.